Where can you find a local restaurant that is family-owned and operated and has been cooking for more than 70 years? Look no further than Ralph’s Barbecue. Since the restaurant is located in Weldon, the Rockfish Capital of the World, it was a natural fit for Ralph’s to want to release their own rockfish. 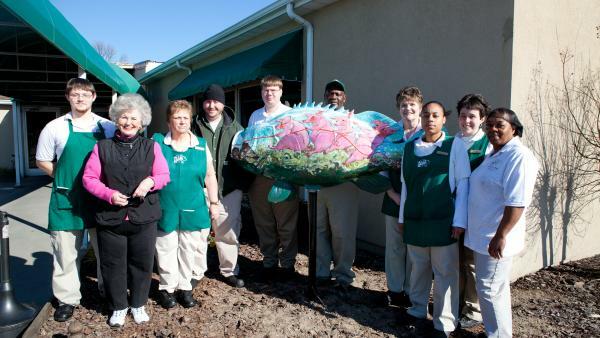 Their fish, painted by local artist Tina Gregory, features the three little pigs catching a whopper of a fish and is located in the flower bed near the entrance to the restaurant. Ralph’s opened in 1941 and has always specialized in traditional Eastern NC barbecue with the vinegar-based sauce. Today, they are cooking and serving seven days a week, 12 hours a day. Believe it or not, by being open seven days a week, Ralph’s prepares 4,000-5,000 pounds of pork each week, and they slow cook it to perfection, starting the cookers at 5 p.m. and cooking 13-14 hours. Ralph’s offers a full table service menu, buffet and take-out. On both the menu and the buffet, you’ll find such things as their specialties – pulled, chopped and sliced pork; Brunswick stew; coleslaw and hushpuppies – as well as other items like fried seafood - fish, shrimp, oysters and scallops; pork ribs; fried, baked or barbecued chicken; and traditional southern side items like collards, potato salad, barbecued boiled potatoes and more. Don’t forget their homemade desserts like banana pudding and a variety of pies and cakes by the slice or whole. Like what you’ve eaten and want to take some home? The barbecue, stew, slaw and all side items are available by the pint, quart or gallon. You can also get pulled or chopped barbecue sandwiches. Wash it all down with Ralph’s good ol’ southern sweet tea. Visit them once and feel like a member of the family ever since.